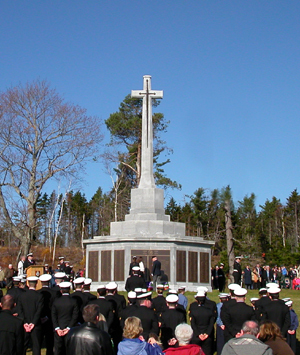 Canadians will attend ceremonies across the country Sunday, May 5th to mark the sacrifices made by the many who fought on their behalf in the epic Second World War Battle of the Atlantic. The Battle of the Atlantic, the fight for supremacy of the North Atlantic, was waged from 1939 until 1945 and pitted Allied naval and air forces against German U-boats, whose primary targets were the convoys of merchant ships carrying vital life-sustaining cargo from North America to Europe. Much of the burden of fighting the Battle of the Atlantic fell to the Royal Canadian Navy (RCN). At the outbreak of war, the RCN was comprised of only six destroyers and a handful of smaller vessels. By the end of the war, the RCN was the third largest navy in the world. The Battle of the Atlantic ended with V-E Day on May 8, 1945.